Has your child been asking for toy shotguns or handguns? Do friends have fake bazookas they play with at their house? If so, you may worry about purchasing toy guns for kids — what if it makes them more aggressive? Imaginary gunplay is actually quite common and almost inevitable. Whether it’s a pop gun, an air gun or a nerf gun, kids love to pack them full of darts and shoot at each other. It’s always a smart idea to think about how play can affect a child’s perception of reality. Does playing with toy guns make kids more or less likely to commit violent acts in real life? We’ll go over the research on the psychology of imaginary gunplay, and then review some of the best toy guns on the market. Use the links above to check the latest prices or read our in-depth toy gun reviews below. Do Toy Guns Make Children Aggressive? Research conducted in recent decades shows the importance of play (source). Play helps kids develop physically, mentally, and socially. It offers a safe space for children to test social norms and learn how to interact with others. This same concept carries over into gunplay. Research suggests that gunplay is one form of play that may serve as a teaching tool. It might help them learn how to work out and overcome aggressive impulses, rather than give in to them (source). In one study, kids that played aggressively tended to behave with less real-life aggression in the classroom (source). This finding supports the idea that play is a way kids test which behaviors will suit them best in the real world. In other words, gunplay may give them a safe outlet for feelings, instead of expressing them in real life. Like most forms of play, however, gunplay is best when parents are supervising the situation. If structured correctly, gunplay can be about sportsmanship, teamwork, and the morality of good versus bad. Researchers suggest, however, that parents should intervene if the game becomes less about strategy and more about hurting and violence. To learn some tips on how to educate your child about toy guns, check out this video. If you’re looking for toy guns, it’s a good idea to consider your lifestyle and their likes and dislikes. Doing this will increase the likelihood that both you and your kids will like the toy gun. Here are a few things you may want to consider when looking for the best toy guns. Dart range: If you live in a small space, you may want to find a toy gun with less range. Find one that only shoots up to 40 feet or something that doesn’t shoot at all. It will put an engineering control on their ability to wreak havoc indoors. Loading difficulty: Smaller children often want to play with their older siblings. Younger kids might do better with toy guns where you place a soft ball or dart in a hole. Pulling out a separate chamber, like with a toy shotgun, may be more appropriate for older children. Buying in bulk: If possible, it’s a good idea to buy a pack of guns, rather than one. It’s much more fun to play with toy guns in a group — your kids will thank you! Now we can rest easy, knowing that most of the time, imaginary gunplay is not so bad after all. In fact, it may even be a positive learning experience for your child. Whether you’re looking to buy a party favor for your child’s birthday or stocking up on costume pieces, we’ve included a bit of everything. Let’s check out the best toy guns available. If your family frequently hosts your kids’ friends, you’re probably always on the lookout for entertaining games. This toy gun comes in a pack of four to make sure your child’s friends can play too. The toy guns recoil when shot and vibrate when hit, so the kids can even play in the daytime. The signal reaches up to 130 feet, which makes outside play even more fun. Plus, no need to worry about cleaning up or losing darts. This nerf gun will have your kids playing for hours. 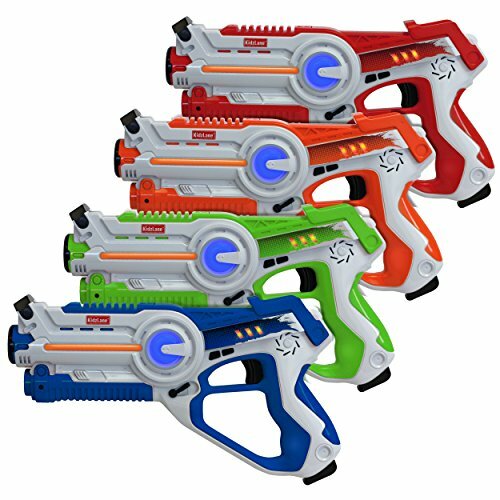 The chamber holds six nerf darts, and they fire one after another, automatically. 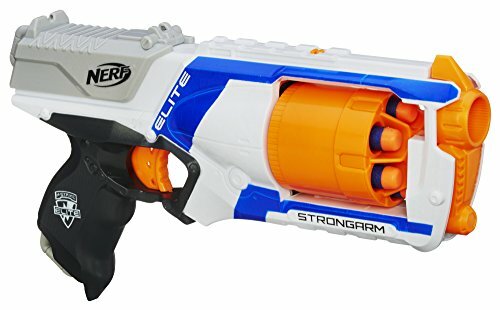 When the darts are gone, the child flips open the chamber and re-loads — no buttons or latches to struggle with during battle. For more blasting power, extra darts and other accessories are sold separately, Nerf has you covered there. 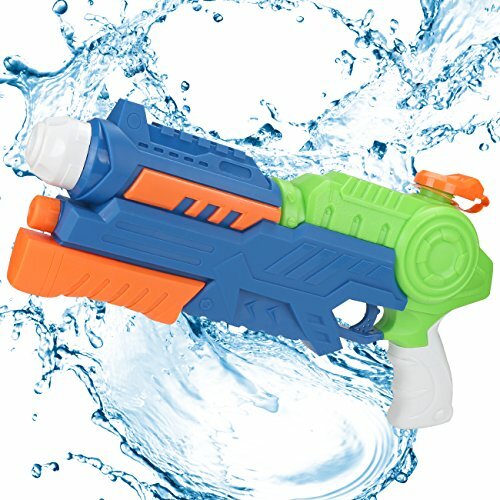 This toy gun is the classic water gun we all played with as kids. They come in a pack of two, great for parents with two kids or for friends to play together. To set it up, just fill the tank with water and close the lid. The kids push and pull the pressure pump on the front to shoot the water. 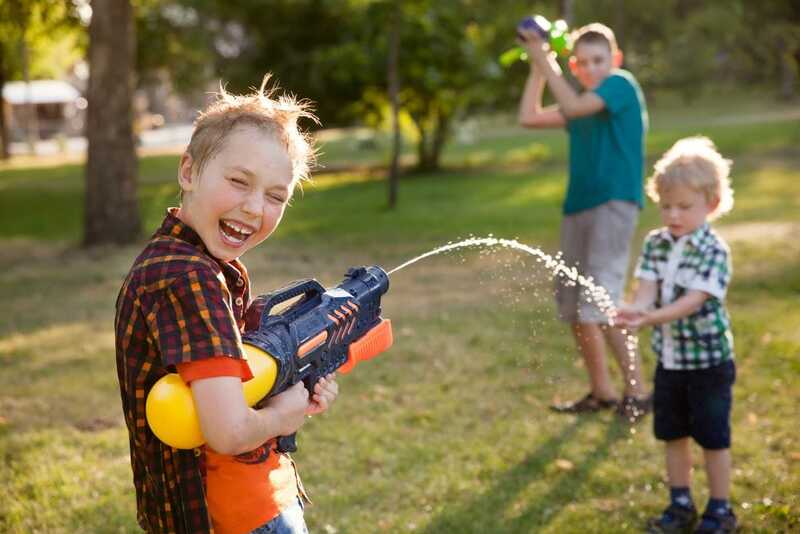 These toy guns are great for the beach, the lake, or just a hot day in the backyard. If someone in your family likes to hunt, your children will probably want to be a part of it in some way. This gun will get them in the mood for duck hunting. They can practice in the backyard and train for the real hunt someday. The gun has a camo design, with a wooden duck on top of it that launches. 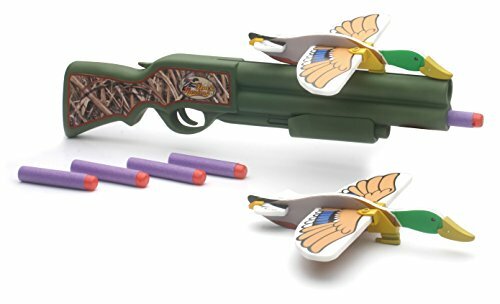 This will help your child associate the toy gun with hunting. 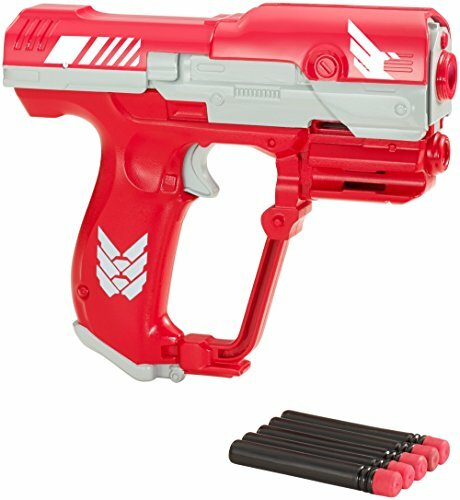 It comes with five foam darts, and the gun will shoot them one at a time to encourage waiting and aiming. If your child plays video games, they might be into the extremely popular game Halo. If so, they will immediately recognize this gun. 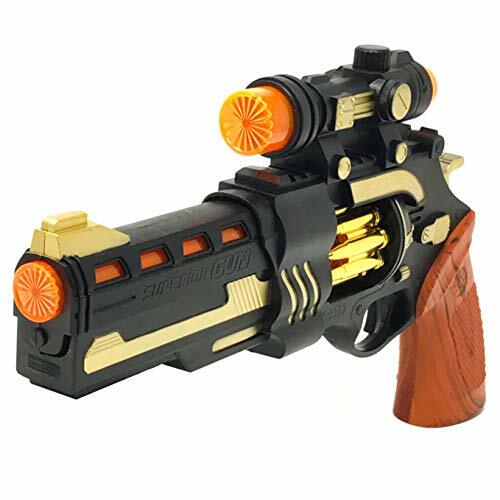 Made by the company BOOMco., the toy gun is available in either red or green to match the team guns in the video game. It comes with five darts, and the gun can fire multiple darts at a time. The darts can fly up to 70 feet, so if they’re playing indoors, nothing in the house is out of range! If you have more than one child, you know the younger one can sometimes feel left out. Toy guns are getting more sophisticated, and little ones can’t always keep up with their bigger siblings. This gun is easy to use and can help your toddler join the fun. 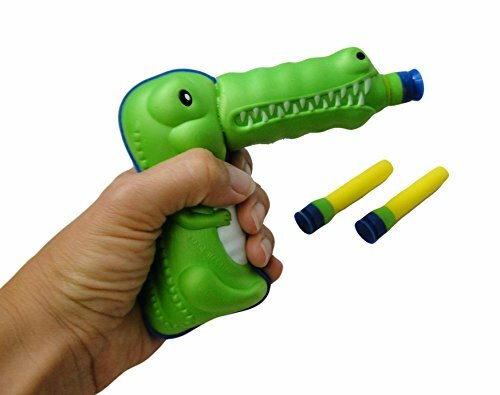 Shaped like a crocodile, it comes with three darts but holds one dart at a time. By learning to load the chamber themselves, your little one can develop hand-eye coordination with smaller objects. 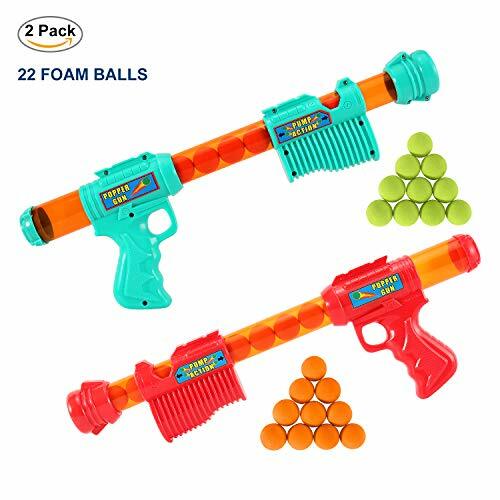 These long toy guns can hold up to 11 foam balls and shoot them in rapid succession. The gun can be carried, or it can be aimed from the ground like a bazooka. Two toy guns are included in this pack. To load the gun, you simply stick the foam balls into the open part of the tube. Your kids can control how far the balls go, by pumping the handle quickly or slowly. Because the balls are so soft, the guns could also be used for inside play on a rainy day. If you have shared the joy of Star Wars with your children, they might want an out-of-this-world gun to play with. 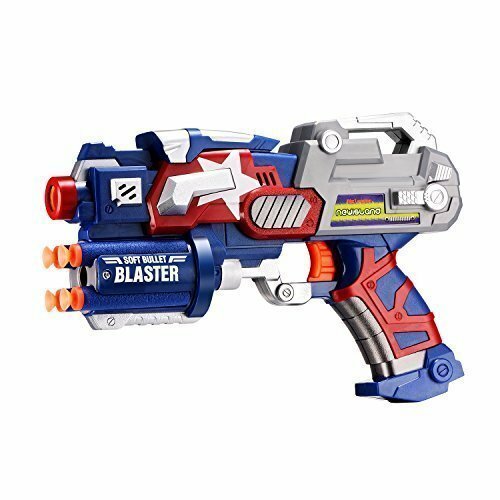 This space blaster gun will make your kid feel like they are waging an intergalactic battle. After loading it with batteries, the kids pull the trigger to unleash a variety of lights and sounds. You will receive six guns per pack, so your children have plenty to share with friends. 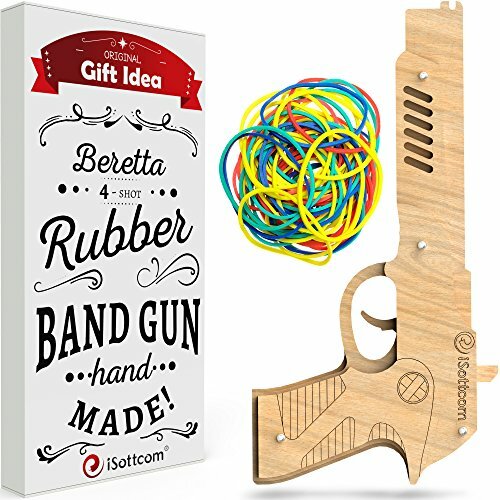 Rubber band guns were all the rage back in the day, and now they’re making a comeback. For parents wary of plastic, this wooden gun is made of eco-friendly material. It can fire up to four bands, back-to-back, with around 50 included in the set, allowing for tons of fun before they have to go out and find the rubber bands again. Because it’s a handgun style, you load the bands and simply pull the trigger to shoot them into the air. 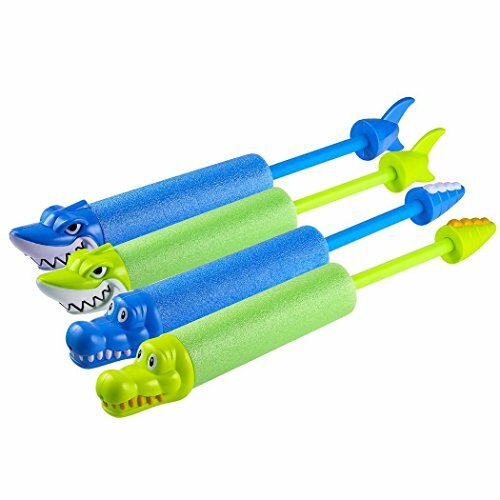 These guns come in a pack of four — two sharks and two crocodiles — to make it easy to distinguish teams. They are surrounded by foam, which allows them to float and not get lost in the deep end of the pool. To fill them, all you have to do is completely immerse them in water. Then pull the arm of the gun back to fire. Perfect for lighthearted pool play the whole family can enjoy. If you’re already thinking about Halloween, you may want to plan your child’s next costume around these toy guns. They come in several different style options, but all are variations on the steampunk vibe. If your kid likes science fiction, they could be ideal. The guns do not actually shoot anything. When they pull the trigger, the gun will light up and make sounds. For kids that need a gun to play the part, but don’t have time to clean up bullets while doing the serious business of trick or treating, this one’s for them. 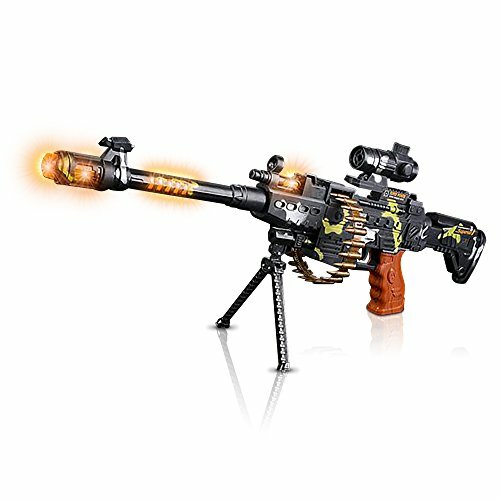 This monster gun comes with a dart board to help your children practice their aim. Rather than shooting at one another, they can focus their game on the dartboard. Loading is easy. They stick the darts in the holes on the front of the gun and they’re ready to go. The darts will fire up to 40 feet, so your kids can make it more and more challenging by stepping further back. Every baby I know loves bubbles. When they are young, however, it can be tough for them to get the whole “blowing” thing down. My kid struggled for so long. 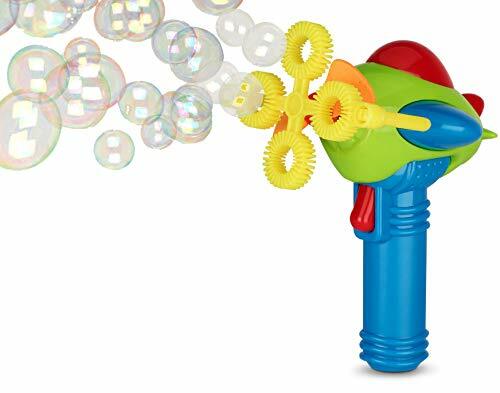 With this electric bubble gun, though, they can easily make their own. They don’t have to worry about filling a tub, but simply dip the wands in a tray with bubble solution. All they have to do after that is hold the trigger and enjoy. 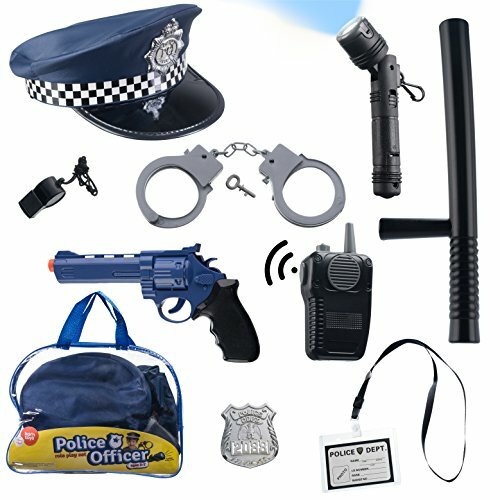 If your children love to play dress up, this toy gun and police gear set is a great option for them. The set comes with a toy handgun, handcuffs, a policeman’s hat, a badge, and other fun pieces of toy police equipment. When your kids’ friends come over, they can create an entire world around this set. When they’re done, the set includes a bag that will store all of the gear until next time. 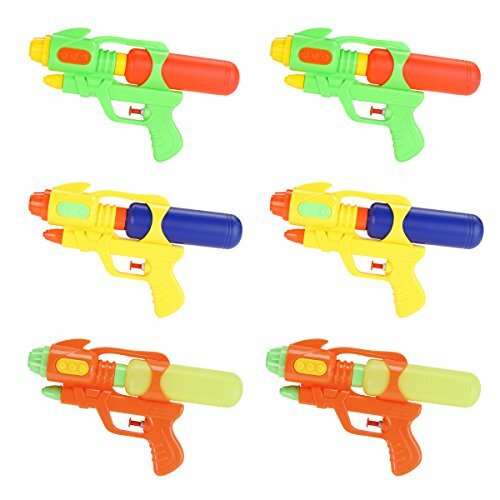 These tiny toy guns come in a pack of six, so they make a great party favor. If you break tradition and give it to the kids way before they leave, it can also make for free entertainment. They’re nine inches long, and use a tube of water to keep them going for a while. Designed to be used by kids of all ages, starting at three years old, even your toddler can get in on the action. 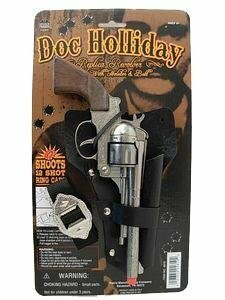 If your child is really into Westerns, this replica of the gun from “Tombstone” is the toy for them. It looks so real, the manufacturer placed a bright orange tip on the end to ensure bystanders it’s fake. The chamber holds 12 shot ring caps, and replacements can be found at most toy retail stores. After loading, your kids just aim and pull the trigger. If you’re lucky enough to live in a neighborhood full of kids, summer battle nights might be a thing. If your child likes to take part in games like these, this toy machine gun can bring something unique. The gun can be set up on the ground or carried in their arms. It doesn’t shoot anything, but it does light up and makes sounds when they pull the trigger. The gun even comes with a real scope to help them watch and take aim. If supervised properly, gunplay can help kids learn how to play in a team and strategize for victory. It’s also a fun way to get outdoors and get some exercise. Guns are a serious subject, so it may be a good idea to discuss the differences between play and real life. This will help them put play into context and understand real-life events. 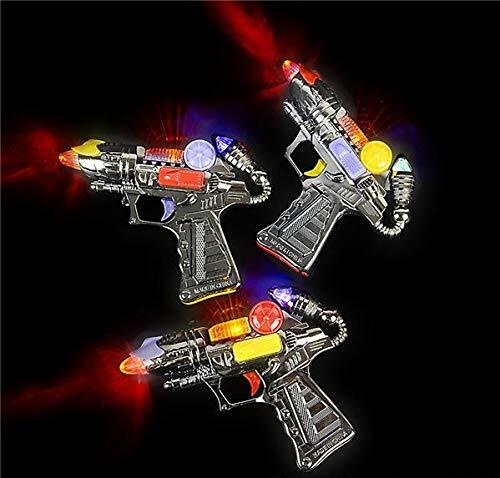 My favorite toy gun is the Kidzlane infrared laser tag. Because they come in a pack of four, you’ll always have ready entertainment for your children and their friends. You don’t have to worry about losing pieces or helping them load up the darts — which encourages your kids to be more independent. What are your thoughts on toy guns? Did your child have a favorite toy gun that they played with? Please share your experiences in the comments section below. And please share our article if you enjoyed it!